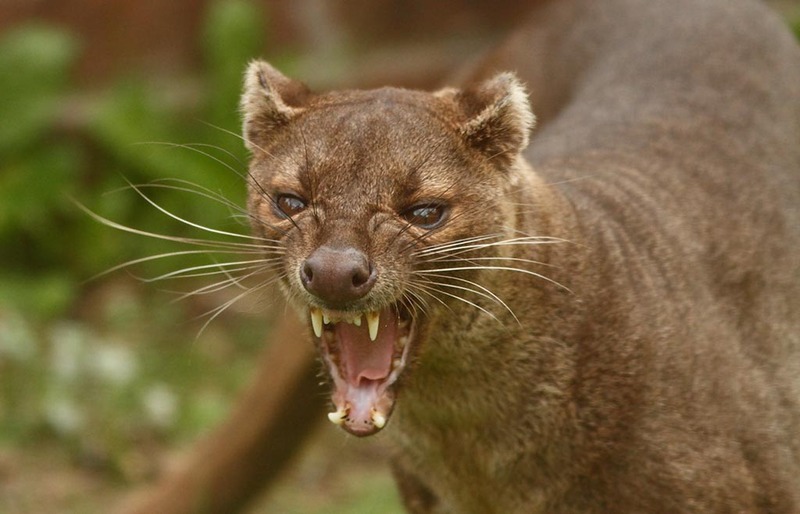 Today I want to write about a really cool small predator, the fossa. These amazing animals grow up to 70 cm long, with a tail that is even longer. They are the largest predators on Madagascar. They look a lot like cats, but are a member of the same family as civets and genets. Fossa are excellent climbers, using their retractable claws to grip trees and long tails to balance as they hunt their prey, which includes lemurs, tenrecs, rodents, birds and reptiles. They usually live by themselves except during the breeding season, when groups of up to 8 males will gather at the bottom of a tree to try to get the attention of a female at the top of the tree. The female gives birth to 2-6 babies, which are blind and hairless at birth. Fossas are found in the forests of Madagascar. They are considered vulnerable to extinction due to loss of habitat. Are there any other interesting facts that you would like to share about fossas?